← Is Your Brain too Serious? Can Writing and Success Help Your Brain? San Luis Obispo’s Freemont Theater felt packed at the 7 p.m. showing of Authors Anonymous this past Friday night. I spotted many local “celebrities” of the writing community in the audience—all happy to show their support for Dave Congalton and his dream now realized on screen. Contrary to how the writers in the movie, Authors Anonymous, were portrayed, I didn’t feel jealous as I applauded Dave Congalton, the movie’s screenwriter, when he walked down the aisle. Dave deserved the praise—he had done the work. During the Q & A session after the movie with director Ellie Kanner and producer Hal Schwartz, Dave explained that he had gleaned most of the material in his screenplay from his experience as a former director of Cuesta College’s Writers’ Conference. Is Authors Anonymous Worth Seeing? The mockumentary-style plot revolves around the reactions of members of a writers group when one of their peers gets an agent. A book deal. A movie. The cast does an excellent job of showing how NOT to deal with a friend’s success . . . if you want to stay friends . . . but I won’t give away too much. You can download the movie on VOD (video on demand) platforms like Amazon and iTunes. If you live in the San Luis Obispo (SLO) area, go check it out at the Movie Experience in downtown SLO. During the movie, I heard chuckles from all sides of the theater, but it seemed like my mom was laughing the loudest. (Dr. Xiroman, a character from the movie who had taken a vow of silence, would not have approved.) Perhaps my mom laughed loudest because she is a writer and writing teacher. During the walk to the car after the show, we discussed the shallow world that had been created on screen—a true bonding moment for a mother and daughter who both love writing. A question I was left to ponder after the movie: Are writers jealous of each others’ success? My answer: Yeah. I think writers get jealous of each other. Typically, these feelings usually spark action to complete a project. I’ve felt a twinge of jealousy more than once after reading stories in The Tribune, our local paper, about local authors’ latest books. I shouldn’t expect too much spotlight since I haven’t been “doing the work” for long. Two years ago, I won third place in the First Page competition at the Central Coast Writers’ Conference for my memoir piece, “The Ultimate Repairman.” Last year I was expecting to win at least a second or first place, but I won . . . nothing. The story I submitted, a fearful tale of spending the night with my new husband in his grandfather’s junkyard, paled in comparison to the winning story about a fragile childhood spent in a hellacious foreign orphanage. However, despite the jealousy, writers can move on and gain valuable insight from other writers. Recently, I’ve found great writing advice from Anne R. Allen’s blog and joined a writing circle with SEO expert, Johnny Base, on Google +. 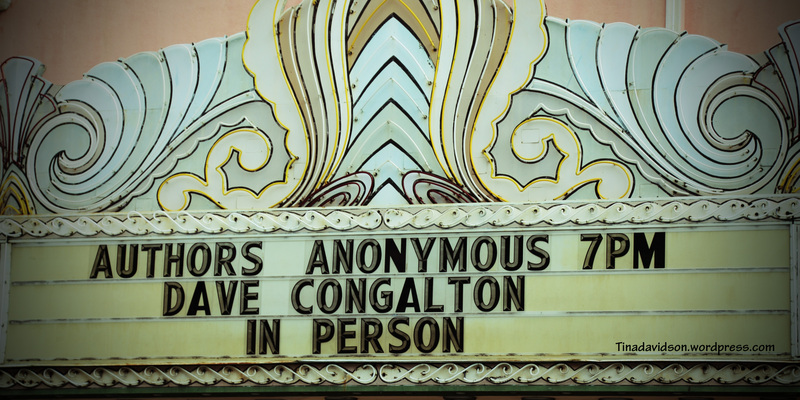 I’ve been inspired enough by Dave Congalton’s movie success to get back to completing my projects and taking more time to let my brain “do the work.” Author’s Anonymous is not Dave’s last screenplay; he hinted at another project that was in the works. Will his brain get better with each success? I can’t wait to see what Dave will come up with next. I would like my mirror neurons to pick up on some of that success. Have you written anything I need to be jealous of? I really would love to hear about it. Creative writing and reading are important activities to keep your brain healthy. I’ve included some links below on how writing contributes to brain health. Watch this short video of Dr. Richard Zogby of The Center for Orthopedic & Spine Care at St. Joseph’s Hospital Health Center. He recommends writing with a pen and pencil (not the computer) for 10 to 15 minutes to stimulate your nervous system. If you work with students check out, The Brain-Based Benefits of Writing for Math and Science, and learn how writing helps develop executive function. The BrainMass shares some health benefits from creative writing in the post, The Benefits of Writing for Pleasure. I enjoyed reading your article. Thank you for writing it. I think all artists are prone to be jealous. We are emotional animals. But it’s not the emotion that does the harm. It’s what we do with it. And using it to ‘spark action to complete a project’ is one of the most productive ways to spend it, in my opinion. Thanks, Leanne. Yes, emotions don’t have to get the best of us (unlike Teri Polo’s character in Authors Anonymous). I agree that our emotions can help fuel great writing! Keep on “doing the work” and keep me posted. Great piece. I loved Authors Anonymous, too. The envy is there in all of us, I’m pretty sure.. It’s natural to feel little twinges when somebody we consider an “equal” rises above us in the hierarchy. But mature people can also feel joy for their colleagues and they can bring that to the forefront of their thoughts. But mature people aren’t very funny, and this film is hilarious. It takes those twinges and exaggerates them. A thoughtful analysis! Thanks, Anne. Yes, it is important to focus on joy instead of jealousy. I appreciate living in a county with such a supportive writing community.